Just curious about how anyone would approach this. This is more a though-experiment than something actionable. These days, recursive node-editors are becoming more and more usual (compared to the traditional node-editors). A powerful feature of TD is that each node has an extendable UI. In a sense, each block could represent a GeeXLab script (or internal node? ), which could open a draggable imgui popup with properties when doubleclicked. Any thoughts on how realistic it would be to create an STANDALONE node-editor app (like MadView3D)..or should it be just a drop-in lua-library (which visualizes the current 'state')? I already figured, that by imagining the editor from scratch (outside of GeeXLab) would be a misstake. That could introduce so many challenges from a maintenance point of view. I could imagine a super-simple first version, by visualizing nodes on the highest level(like representing lua- or python-scripts, and/or objects from this framework: https://www.geeks3d.com/forums/index.php?topic=5171.0). Later, one could always introduce 'zooming' into such node(s) (which would open a new node-editor, representing the internal GeeXLaB nodes), but i'm not sure whether that would add any value at all. If anyone has any thoughts or advice on this let me know here! 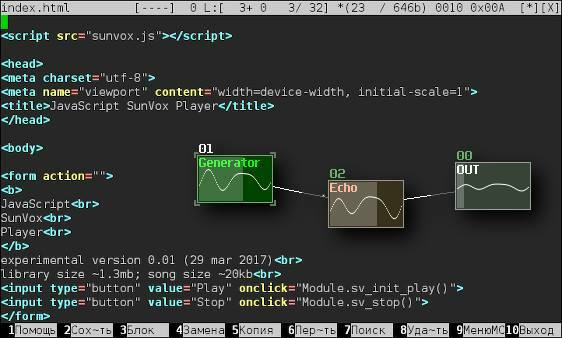 The imgui-node editor you found sounds interesting. I think it can be coded with GeeXLab. I wonder how the splines have been done? With ImGui functions? I will look at it asap, I will probably learn new stuff about ImGui! I found the answer in the node editor source code. There are handy functions to draw some primitives with ImGui like AddLine(), AddBezierCurve(), etc. I will try to add them in GeeXLab.